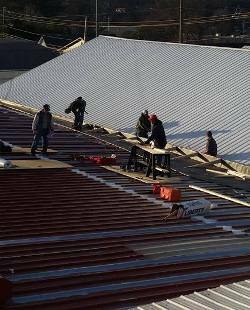 If you’re on the lookout for information about commercial metal roofing prices, whether to replace an existing metal roof or for new construction, you’ve come to the right place. Metal roofing is an incredibly durable roof product, known to last, on average, 40 years or more before it needs replacing (although ongoing maintenance is required and such quality comes at a cost, of course). For 2018, the average cost of a metal roof in the United States can range from about $4 per square foot (installed) all the way up to $13 per square foot. The economy of the area in which you live can, of course, play a part in the final price for your building. Corrugated steel panels range between about $4 to $5.65 per square foot. Metal shingles run between about $7 and $9 per square foot. Stone-coated metal roof tile costs between about $8 and $9 per square foot. Standing seam metal roofing is between about $7 to $13 per square foot. Again, these are final, installed prices—not just the costs for materials. In addition to the roofing materials, a contractor’s costs can include things like removal of the old roof, if needed; repairing the roof substrate; debris removal; ventilation; flashing; building permits; and more. Many building owners aren’t aware that an outstanding alternative to roof replacement exists, costing much less than roof replacement and greatly extending the life of an existing roof. This solution is called a roof coating, and older metal roofs can be good candidates as long as they are not rusted or corroded to the point that it isn’t safe to walk on them. Rated to withstand some of Mother Nature’s worst—even hurricane-force winds! If roof coating sounds like an incredible solution, that’s because it is! Among the members of the Choice Roof Contractor Group, a trusted nationwide professional roofers’ association, commercial building owners can find verified roofing contractors serving their area. Members are carefully screened, must be fully insured and licensed and have an exemplary track record, and they are held to group standards of excellence, so you can rest easy that the contractor you hire is held accountable. In addition, CRCG members are among the only roofers in the United States to offer a “Lifetime Service Guarantee” on the work they perform. What this means is even greater peace of mind, because a Choice Roof Contractor Group member will always be available to service your roof—even if the original roofer who initially performed the work is no longer available. This is, indeed, a rare and amazing guarantee within the roofing industry. To find a trusted roofing contractor in your area, call the Choice Roof Contractor Group today at (800) 670-5583, or visit the contact page of our website. This entry was posted on Monday, January 22nd, 2018 at 5:16 pm and is filed under Building Owners, Commercial Roofing. You can follow any responses to this entry through the Comments Feed feed. You can skip to the end and leave a response. Pinging is currently not allowed. You are so right Cami! I home more home owners read this article, as most of them are not familiar with the cost advantages they can with the roof coating. You are correct, investing in a quality metal roof, highly skilled roofer and nice weather resistant coating is the best investment a home owner can do to get the best value out of the roof. Really good information! I didn’t realize a roof coating was an alternative that could be offered to my customers.